Mongolia is a pretty safe place for most travellers to visit. Mongolia is one of the least crime-ridden countries to visit. With one of the lowest crime rates in Asia, you won't have to worry too much about getting into trouble while visiting, so long as you play it safe and use common sense. 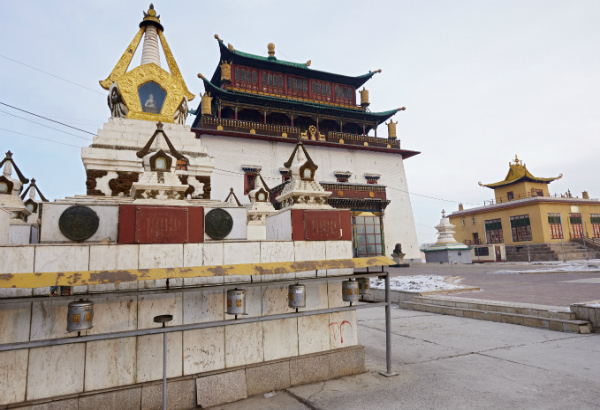 The biggest concern when travelling in Ulaanbataar or any other Mongolian city is that you might get your purse slashed or your wallet stolen. It's petty theft but really annoying and troublesome if you lose your passport and all your cash. Put them in a money belt or locked up back at the hotel. 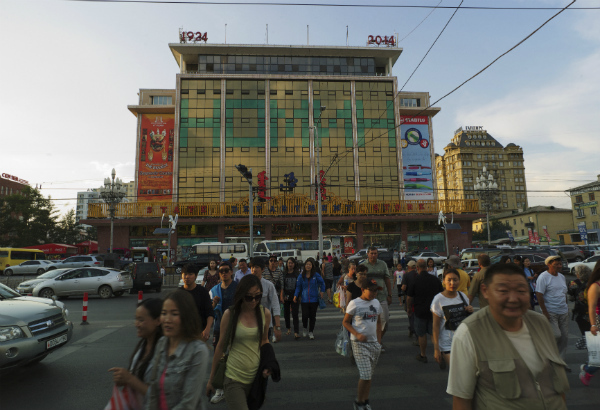 Mongolia has seen a recent rise in ethnically-motivated violence. Ultra-nationalist Mongolian groups single out individuals with Caucasian, African or Chinese features just because of the way they look. Xenophobic and nationalist groups are most likely to target you if you're a white, black or ethnic-Chinese man speaking with a Mongolian woman. If you are a single male travelling alone, be very aware of this dynamic and try not to flirt too much at bars or in clubs. There has been a string of racially-inspired attacks since the spring of 2010 against inter-racial couples ranging from deliberate, planned attacks to assaults of passion at bars. Don't travel by yourself late at night. Keep a low profile at all times (as best you can being Caucasian, African or Chinese!) and simply enjoy yourself. Getting into political arguments with locals at bars or acting in an antagonistic manner is sure to have consequences you don't want. There are limits when it comes to trying to blend in, guys! These areas see a variety of organized criminal groups operating on a daily basis, so if you plan on walking through, be sure you have your money stashed in a safe place. The airport is rich pickings for thieves because many travellers are so weary from their flight they forget to pay attention to their money and easily parted from it. Don't rest your mind until you get to your hotel room! If you're travelling on the train or bus for extended periods, such as on the Trans-Mongolian Railway, strap that money belt under your shirt. This way, you can sleep on the train without worrying about your things. Try not to wear expensive jewellery or accessories when you go out. Thieves won't just steal your cash, they even flogged a prayer wheel..
Also be aware that unmarked cars often drive the streets of cities with the window rolled down, offering to give you a ride. Be wary! At best, these unmarked cabs will offer poor service for an overly expensive price. At worst, they will be in on a scam where you are held up for all the money you're carrying. If you need to take a cab, be sure to schedule one from your hotel, restaurant or store and have people there assist you. Large groups of teenagers or kids may harass you for your money upon leaving a bar. Generally, as long as you keep your money hidden and out of sight, they will leave you alone to try to find someone showing more obvious bling. These groups are generally harmless if you move through them, but they may seem scary at the time because there are so many people. 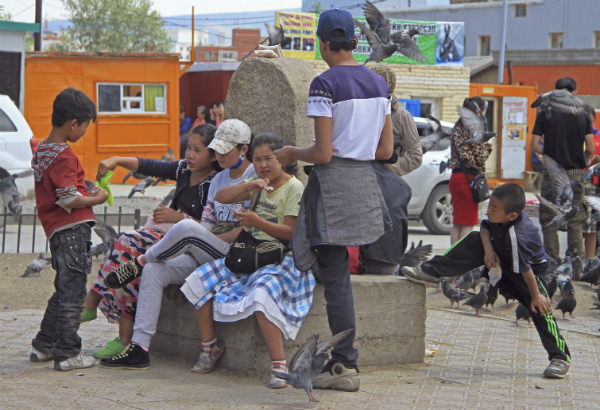 Times to be aware of increased criminal activity are the Naadam Summer Festival in July and the Tsagaan Sar Winter Festival, when lots of tourists are around. Don't keep your valuables in your pockets, because organized crime syndicates with plenty of experience pickpocketing are sure to be trawling the areas discreetly to steal whatever money they can find. It may seem like a fun idea to travel across the desert or scrubland by horse, especially if you are travelling with other tourists or a guide you picked up locally. Armed bandits may follow your group across the desert and steal all your stuff, including your horses, while you sleep. The local guide may either be a patsy or in league with the thieves. Either way, you will end up out of luck and stuck in the desert. 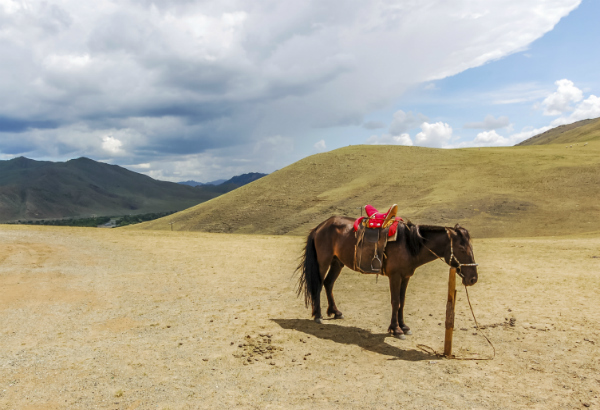 If you want to travel further afield and see some of the stunning natural beauty that Mongolia has to offer, make sure you travel with a respectable touring agency. How generous, they left one behind.. Finally, one common scam if you're crossing the border from Mongolia into either Russia or China is to be stopped and harassed by someone in an official-looking uniform. This person will attempt to inform you that you are required to have travel insurance in order to travel across the border and will sell you the "required travel insurance." This is a flat-out lie designed to trick westerners into giving up money for nothing. Don't do it! There is no such thing as required travel insurance, and the uniforms were probably borrowed, stolen or manufactured, and you already have a great WorldNomads policy! Ultimately, crime in Mongolia isn't a huge deal. Just don't trigger local nationalist or xenophobic elements, don't keep your money where anyone can see it, use your head and your wallet and life will both remain safe. Stealing your horses is a national past-time. Almost a guarantee if you are not with a group led by a Mongolian. I know two different instances last summer of Europeans buying horses and traveling with only a friend and no Mongolian guide. They were lucky to get out alive was the word they got from their local consulate. Seems like the further north you go in Asia, the more dangerous the scams and crime become. I am a Mongolian citizen as well as a lifetime resident of this country. The statements made in comment of this article are all, despite being true to an extent, are insidious and pessimistic in their nature, with a doctrinaire and opinionated depiction. I have been raised, learned and lived in this country. There are just as many affable and honourable people as there are criminals, in fact, even more so. When visiting do not fester fear to a point of paranoia. It is not as bad as some make it out with embittered words. Mongolia is an LEDC so there will, of course, be some faults but it is mostly due to the structural strain present in many a person's socialisation with the large poverty tarnishing the economy, as well as certain cultural transmissions among destitute areas. Of course you must always have a cautious awareness and utilise the archaic tool of common sense and your brain. But with self-awareness and conscientious cognisance of your surroundings, there should not be any drastic or cataclysmic events in your visit. Ask trusted or educated locals about particulars and small tips for travelling and figuring out the societal functions and dangers, to help. But this is something that will help you adapt to the culture, it is polite and should be an interesting experience for foreigners . -Have fun and all my best wishes! Mongolia is finally a good place to travel to, it was very pleasant time to work and live there for several months, it was amazing place and lovely people, safe and beautiful. i was living in area near Lenin Museum, in diplomatic apartments, i was moving alone in all direction of Ulaanbaatar, no single incident happened to me (Caucasian), all what i can say i wish if i have the time and will to go there again. I have lived in Mongolia for more than 10 years and during these years I have had a great experience. There are some thief but the police here would handle it . Living here at Mongolia, ub has encouraged me to not be worried if something bad is going to happen. Visiting the city is a good idea but the true nature is in the countryside. Mongolians have an unique tradition. During the summer it's reall hot up to about 30-50 degrees , well maybe from were you come from it may not be hot . Mongolia has a magnificent nature and history . The nature built statues and places that have many legend are totally magical. Mongolia is not a safe place. Period. As a Mongolian, I have first-hand experience. It's NOT safe. Well in UB you have to pay the police for a crime report ans odds on if you get attacked and robbed the police will be close at hand to protect the thieves. My robbery was all caught on Camera. Nota chance in hell the police would do anything and 3 days to get a police report without being interviewed! I think mongolia has.. or atleast had by far the highest murder rate in asia. Viloent crime and assult are more common..
Alcohol is a big factor and in isolated areas its just a lack of police. I have seen people carrying guns in some rural areas and when asked they said it was less for hunting and more to shoot robbers. sks and ak47variants.. not bolt action rifles. So there is crime but i think its not geared specificaly to tourists its just the nature of the country... generally id say mongolia is much better than kazakhstan or for crime and the violent street thug type is not so common. Gopniks ect. And over the boarder russian parts are really violent. I passed through tuva and its is a dangerous place. The locals can kill for something small and most people carry around knives. In broad dayligh murder on the street of kizil is pretty common . Maybe one guy swears at the other or dosnt share the vodka.. or his cousin stole a horse 50 years ago. No hesitation just stab him bash his head.. But tuvans were great hospitable peopleand many are quit good natured so it was to understand how they were so lawless. Murder rate was 85 or90 per 100,000 its the highest in the world. They just thought if you fight you got to kill the guy.. still in the medeival culture..
Mongolians just next door were not like this. Drunks could have a fight and let it go.. tuvans would know the other guy down and slice off his head and just hide in the forest for a few years till the police gave up. If you travel with native person (Mongolian) nothing bad is going to happen.